I did something in this episode that I’ve never done before. I let someone interview ME about my farm fresh lifestyle and how I run my Living Homegrown business. I thought it would be a fun way to answer some of the questions I get about how I juggle the podcast, my garden, family and all my many projects. Well, this episode should answer all those questions. I had Bev Ross from the podcast Drink & Farm do the interviewing and I hope you like it. Although it felt a little odd to be on the other side of the mic for my own podcast, I think Bev hit on many of the questions I typically get in my inbox. So, you’ll have to let me know what you think! I have been loving these podcasts! Truly wonderful! Educational but so fun! Thank you Taylor! I really appreciate you writing to tell me that. It means the world to me. 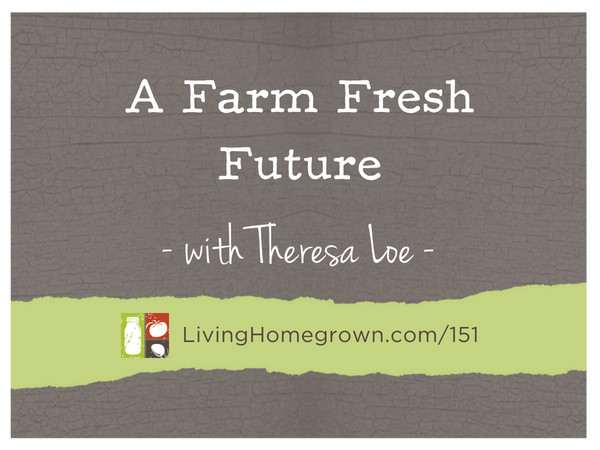 Hey as a solo homesteader I have really enjoyed the encouragement I get from each podcast! This one was especially nice getting to know you a bit better. You’re an inspiration. Thank you Olivia – I’m so glad you enjoyed it! I cannot tell you how much I enjoyed this podcast. Oh my, I had such a limited, tiny view of all the things in which you are involved. It was extremely interesting. Hope we can hear more about your future home/orchard. Seems like a visit to your place would make a great destination of a Growing a Greener World segment. Would love to see some photos of your place. (Perhaps you are on instagram and I am unaware. I am bit of a little old lady when it comes to tech stuff.) So interesting about you realizing that engineering was not your passion. (Wonder how many people are not allowing themselves to move away from their degree and head toward something more meaningful.) Never realized one could produce a tv program without being present on the set. I need to google what a tv producer does, exactly. Theresa, you are one hard working, interesting, gifted, organized business woman and teacher! I have enjoyed your podcasts and will listen with even more enthusiasm in the future. Thanks for including all of us who truly want to dabble in this farm fresh, living homegrown endeavor………..even if we don’t have the farm. Blessings! Thank you so much Kim! I’m really touched that you liked the interview so much. We have team meetings to plan out which stories we will tell for the year and plan out 13 topics. Then I would take half of them (5-7 of the episodes) and work on them one at a time to find the perfect location and the perfect person to interview on air to cover that topic. I do a lot of phone interviews to nail down how we best tell the story. Then, I write a script for that episode which maps out the story and the exact questions we ask, which segments go where, etc. That script is then reviewed by the entire team and we refine it until we all love it. Sometimes I AM on set – mainly when it is an episode that I really want to experience in person. But the person who is “on set” running the show is called the “Field Producer”. They are in charge out in the field. If I am on set, I can take that role. Other times, a different person on the team is the Field Producer. It varies. This way, I can stay at home with my family and only go on set when I really, really want to. Very interesting, indeed! Thanks, Theresa! I love your podcast! I’m interested in the pluerry tree you talked about in this episode. It sounds so interesting! Do you know the name of the one you planted? Thanks! Loved learning a little more about your day to day things. I have listen to all the podcasts up until this point and love them. I feel like you are a friend and a awesome mentor! Thank you for the motivation and all that you do to help us all live a better life!